A year ago there was just one Pocket PC with 640x480 VGA screen, this was the legendary Toshiba e800, which stayed unique a year long. In the late 2004 - early 2005 we can speak about the competition in the Hi-End PDA segment. One can choose among 4 models at least. Today in our review we extended the usual structure of our tests on productivity and battery life and change them visually. Hi-End Pocket PC profile has distinctive features, we can define some general ones: two slots for extension, two wireless adapters, VGA-screen (obviously), relatively big dimensions, price of $500-600. Very often expensive PDAs are positioned as corporate devices and thus have no cameras. It's an impressive list, isn't it? Now let's remove from the list models, which aren't actual or unavailable for the final user. Asus A730W is the modification of Asus A730, it differs from Asus A730 in an integrated Wi-Fi module, larger RAM, extended standard kit and the shell color. At first we didn't want to include the A730 in the list (just mention in brief technical differences), but different productivity performance (because of the replaced RAM chip, we believe) and different standard kits made us enter both models in the list. Next come two modifications of Casio model (the senior version features Wi-Fi wireless technology), which we remove from the list at once, as the model is available in Japan only, with the Japanese version of WM2003, dimensions and weight are of a brick (140x80x25 mm, 300 g). In all, there is no pity, the model didn't come outside the Japanese market. Fujitsu Pocket LOOX v70 is the full copy of Asus MyPal A730 designed for Japan. Here we have Fujitsu Siemens Pocket LOOX 720 and 718 modification, which we'll treat the same, Fujitsu Siemens Pocket LOOX 718 has no camera and is cheaper. We won't review the handheld by Hitachi for the same reason as in case with Casio - it will be launched in Japan only, with the Japanese version of WM2003, large dimensions and heavy weight. However, this device is the Zaurus SL-C6000 under another trademark and powered by another OS - Windows Mobile 2003 instead of Linux! Toshiba e800 deserves a decent rest, it is taken out of production. It doesn't take part in our comparative test. Toshiba leaves the PDA market, and probably Toshiba e830 is the last model by the company. This may be one of the reasons for such attitude in marketing and engineering of this PDA. Toshiba e830 has nothing brand new against Toshiba e800, the model is wrapped in the old shell, and it has no longer the graphical accelerator (!) and both wireless adapters. The PDA isn't officially shipped to the US, several European countries (including Russia). In those regions where it is available the price for it is too high. Well we have an odd model, neither users, nor the company are interested in it. Well, eventually our list involves 5 handhelds, let's call them. None of the current handhelds has an unsuccessful design. Each model has its individuality. No doubt, professionals worked out the design, all candidates deserve high marks. We won't judge, which model has a more interesting design or looks more attractive. Note that, within their own product lines, these models carry the best design. It's up to you, our reader, to choose. We hope that the following photos will help you make your choice. As for the quality of the shell, the model by HP stands out from the line - most of it is made of magnesium alloy. Other handhelds feature high assembly quality, but still they are made of plastic. 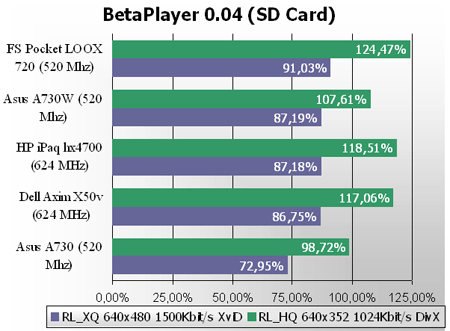 There is a certain backlash in FS LOOX 720 (depending on the sample) and Asus A730. In all, HP iPaq hx4700 has better assembly quality, and other models stay at the same level. HP iPaq hx4700 is the biggest and the heaviest model (due to its large screen and capacious battery), and Asus A730W - the smallest. All models are equipped with two slots, i.e. they are definitely bigger than single slot PDAs and weighty compared with HP iPaq 1940, for example. Many still postpone the purchase of a VGA Pocket PC waiting for smaller size solutions, however there is none at the moment. Talking about dual slot models, we can say that Dell, Fujitsu Siemens and Asus have almost optimal dimensions. You won't feel its weight or size, when the handheld rests in the pocket of the jacket or in the belt case, but not in the pocket of the shirt or jeans. This time again HP handheld stands out for its ergonomics - there is a touchpad instead of an ordinary joystick, like in notebooks, but of smaller size. There are two main shortcomings about it - you have to get used to it, even if you had an experience with notebooks, this touchpad isn't adjusted for arcade games. Several months have passed, but I'm still not used to it completely, however some of my friends find the touchpad of the iPaq hx4700 very comfortable, others just connive at it for and enjoy advantages of the model. The ergonomics of FS Pocket LOOX 720 is close to the classical ideal. The device has convenient grooves at sides and big buttons and the joystick, it lies comfortably in hand, and it's the only model with the scrolling wheel. With the default settings the buttons have a backlash, which prevent from playing arcade games and emulators. It's possible to improve the situation by switching off the button hold function, for example with ButtonHold Switcher (download it here). Dell X50v lacks the scrolling wheel. The joystick and buttons have no backlash, however they are too small and located very close to each other, providing little comfort in gaming. Asus model fits games better with its comfortable buttons. If you plan to use your Pocket PC as a game console, I advise to pay attention to Asus A730 or FS LOOX 720, Dell X50v is less appropriate here, and HP iPaq hx4700 isn't designed for it at all. The winner in ergonomics is FS LOOX 720 (the scrolling wheel, comfortable big buttons and grooves at sides). Let's pass over to the standard kit of the VGA Pocket PCs. Naturally all handhelds come with cradles. Asus and Fujitsu Siemens add to the package extra styluses. Asus A730W has the fullest kit, which includes a USB-host cable to plug peripherals and an extra battery of extended capacity. Dell and HP models have comparatively poor packages. All these PDAs can be charged without the cradle and via USB. HP iPaq hx4700 lacks the carrying case, but there is a translucent screen cover instead. We think, there is no need in the case, if you handle the PDA carefully, the screen cover will be enough. Dell and Fujitsu Siemens supplied simple and cheap-looking cases in the kit. They will do at first, till you buy a good case. The vertical case for Asus model deserves some good words - it can be attached to the belt, has a wrist strap, soft inside, closed by hidden magnet lock. It makes pleasant impression. One of the most important criteria in the PDA choice is the screen, you should pay due attention to it. All PDAs can be divided into two groups. The first group includes screen made by Sony - HP and Fujitsu siemens models. The rest models with matrixes by Sharp belong to the second group. Sony matrixes prove to be fairly better with viewing angles, brightness, the image doesn't get inverted, even if you look at a zero angle. Subjectively they render colors better. HP iPaq hx4700 is equipped with the best screen, which is the major plus of the device. It's bigger and has a wide backlight settings range, a perfect minimum backlight level, it's good under the sun, there are auto backlight settings depending on the illumination. In a word, it is the best. Then goes the screen of the LOOX 720, the device features less backlight levels, a shorter diagonal, the image quality is that by Sony (viewing angles, color rendering). 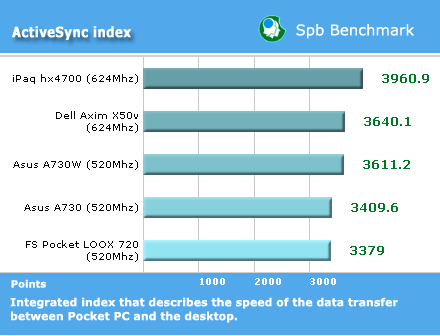 The third place is shared by Dell and Asus, both models have comparable features. If we have a closer look at the models, we'll notice that white colors on the Asus screen get somewhat blue, but you'll see it with the naked eye, only if you lay HP and FS handhelds with it. The HP screen is larger by 0.3-0.4" compared with others. Is it crucial? There is an opinion that only screens with a 4" diagonal (not less) can ensure a normal work with the VGA screen. We think it's not true, other diagonals do provide a comfort work. Yes, there is a certain difference, like between 15" and 17" monitors, but that's not crucial. The last thing to say here, very soon the production of Dell X50v will involve Samsung displays instead of Sony analogs. It's too early to discuss the quality. The reason to replace LCD matrix comes likely from the wish to cut costs. All the models are equipped with removable Li-Ion batteries of different capacity. HP iPaq hx4700 is an absolute leader, it lasted longer in all modes, another plus for this model. FS Pocket LOOX 720 performed also well. 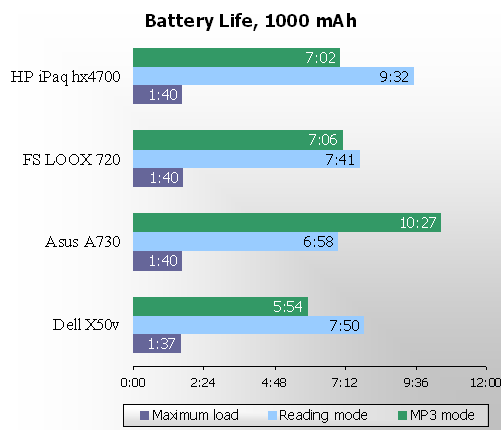 Asus and Dell PDAs stay behind due to weaker batteries. We'll do the following to assess the power consumption efficiency. We assume, the battery charge is spent evenly (quite a real assumption), and all the batteries are capacious of 100 mAh. Let's call this index the effective battery life (EBL). Thus we have an opportunity to estimate the influence by other factors, first of all of the screen and the processor. The first thing we pay attention to is that under the maximum load all the models have the same EBL. As a matter of fact, when all elements are active it's difficult to optimize anything by increasing work time. In this case we have an interesting result, the screen area (i.e. backlight area) had little influence on the battery life. 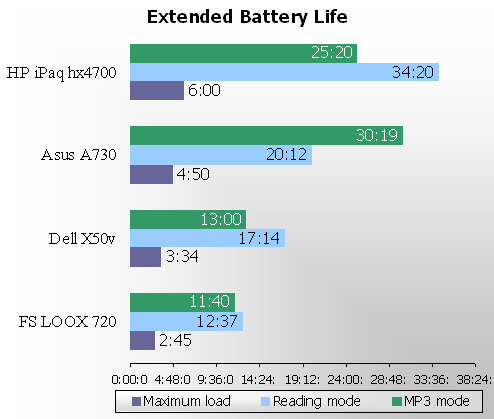 In the reading mode HP iPaq hx4700 stands slightly out with its performance. There is a simple explanation to the fact, this handheld has a very low backlight level, the screen is almost dark, and thus the power consumption got lower. Besides the auto adjustment of clock rate in this model proved to be a good one. We can also single out Asus A730 in the MP3 mode. Due to what factor? The power saving mode makes the clock rate lower to 104 MHz (the device gets slower in operations, but it copes with the playback well) and to 208 MHz in other models. 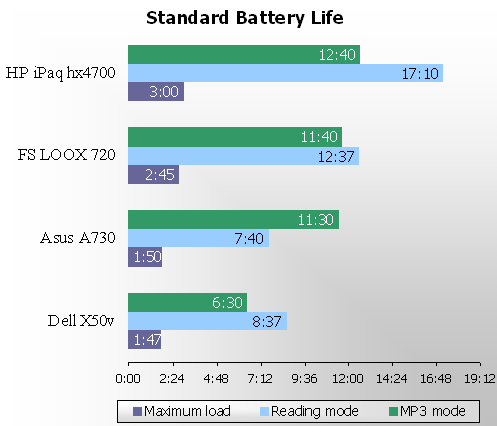 Almost all models have an opportunity to extend battery (foe extra money, of cause): HP and Dell have batteries of extended capacity, Asus - a jacket with the spare battery. Only FS Pocket LOOX 720 lacks either chance. Given our assumption of the even charge spending, we made a forecast on the highest possible battery life with extended batteries or jackets (however in case with Asus we aren't so sure, the charge will be spent evenly, but the results won't change much). This time again the HP PDA proved to have the longest battery life, Asus A730W comes next. I'd note, the jacket in Asus model adds greatly to the weight (almost 300 g) and the size of the PDA, they are hardly allowable. FS LOOX 720 has a way with the spare battery, which can be recharged in the cradle. However we believe it a half solution, as you always have to remember to recharge this spare battery, carry it with you and make extra moves to replace a drained battery. Asus made a last minute's decision and added an extra battery to the kit of Asus A730W. The problem is that you can recharge it only in the handheld. The cradle has no spare slot for the battery. To add, an extended battery for the iPaq is supplied with its own charger. The standard Bluetooth + Wi-Fi pair is available in all these models, except for Asus A730, which has only Bluetooth. Bluetooth. 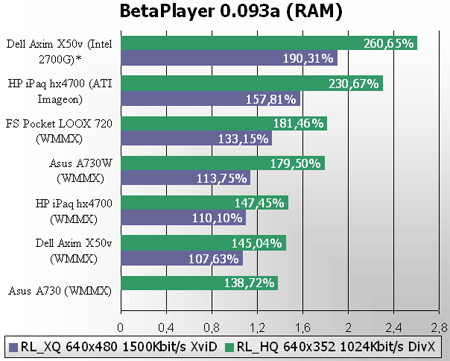 These models come with Broadcom drivers, which have long become a kind of industry standard. We faced no problems with Bluetooth functionality, all profiles worked smoothly. The built-in Bluetooth radio technology enables Internet access via the phone, data synchronization with PC, data exchange, creation of local networks, gaming and so on within 10 meters distance. Wireless-Fidelity. Wi-Fi standard wins more and more popularity in the world, mainly due to Intel Wi-Fi has become almost an integral part of new handheld computers and notebooks. It can be used to enter the Internet within wireless access zone and from the home access point, as well as to make calls via Internet (VoIP). Lately Skype client for PDA has got very popular. How to talk on this Internet-phone? Well, Bluetooth and the voice profile support come in handy here, i.e. you can use a Bluetooth-headset. You can also use a wire headset (not supplied in the package). In all, wireless modules in all given models work at the same level. Built-in utilities for Wi-Fi are weak (for example, you can't set WPA in the LOOX 720, however as a matter of fact this PDA supports this wireless connection security standard), you'd better install some exterior manager such as PocketWinC. IrDA. An infrared port can differ in speed: Slow Infrared (SIR, 115 kbps), Fast Infrared (FIR, 4 mbps). There is also Consumer Infrared (CIR) that features long distance effect, it can control remotely home appliances. We won't go into details, just tell you that there is no PDA with full CIR support, only SIR or FIR with different signal power. That's why you can use them as a remote control, the maximum active distance varies from 20-30 cm to 10 m depending on the chip. USB. In theory all new PDAs support USB-host (the opportunity to plug other devices, for example, a keyboard or a HDD-USB drive) at the plate level (processor, graphical accelerator), but not all models have a host led to the connector contacts. In this aspect only Asus A730 and FS Pocket LOOX 720 support USB-host. Let's mark an interesting peculiarity - synchronization connectors of Asus A730 and FS Pocket LOOX 720 are compatible (cables and chargers do fit). All top Pocket PCs carry from 64 to 128 MB onboard. A part of this size is busy with the operating system at the start, in the specs you come across this size usually. As a matter of fact less memory is available - some of it is busy with preinstalled applications and some of it is additionally reserved by the OS. 40-50 MB of RAM is usually enough for the normal functioning, and 30 MB is already tight (you have to think of other places than RAM to install applications). However large RAM is not always good: the copy of the reserve memory is larger, and the battery life in the standby mode gets shorter (only memory is fed). 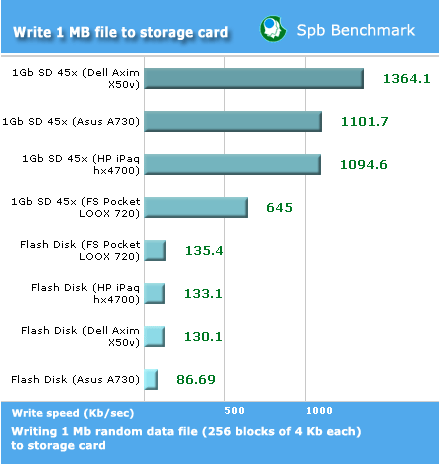 Taking into account prices for flash cards and the size of internal flash memory, the latter is of little use. Besides its speed is too low (we'll see it later). It can be used to backup data and store small files (it's of help in the iPaqs, as when the battery is drained to 10%, external cards get switched off). All the models have both SD/MMC and Compact Flash slots. Thus there is no problem in extending total memory size to 5-6 GB (the package with 1 GB SD + 4 GB CF costs some $430). Each slot can be used to plug peripherals (for example, GPS receiver). 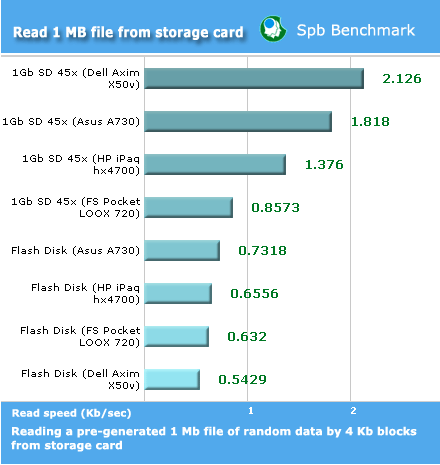 Let's test the memory speed with the SPB Benchmark test package. 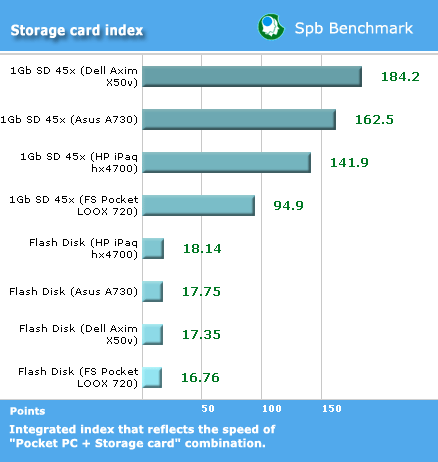 The storage card index shows that Dell X50v is leading with its storage card speed, and Flash memory is very slow in all PDAs. Let's look at the components of this index. The maximum read speed makes up 2.1 Mbps (Dell X50v). However, in the USB 2.0 card reader the same SD card can be read at 9.6 Mbps. That is, the read speed in the PDA isn't limited by the card speed, but by the slot speed. The read speed from the Flash memory is low. As for the write speed the results are similar - the speed is up to 1.3 Mbps, and much less for the integrated Flash memory. In the USB 2.0 card reader the write speed makes up 2 Mbps, compared with the slot speed the lag is less. PDAs do not deal with stream video and do not convert DVD files. In all, there is no need in high speeds. Let's have an example with the highest quality video playback. This is the maximum stream of 1500 kbps or approximately 0.2 Mbps. I.e. even the slowest internal Flash will cope with this task, not to mention the playback from the memory card. In usual usage you won't notice the difference in slot speeds, the extreme speeds prove to be unclaimed. All PDAs have the standard 3.5 mm audio jack, so you can use your favorite headphones. The sound quality in Fujitsu Siemens, HP and Asus is high, it's possible to use these handhelds as an MP3 player. The model by Dell has subjectively worse quality because the sound post processing is off (read the respective review to learn how to switch it on). HP iPaq stands out for its very high maximum sound volume. Well, there is nothing more to add here. Initially we've used the SPB Benchmark package to test the productivity. For this purpose we've chosen Pocket PCs with similar features. 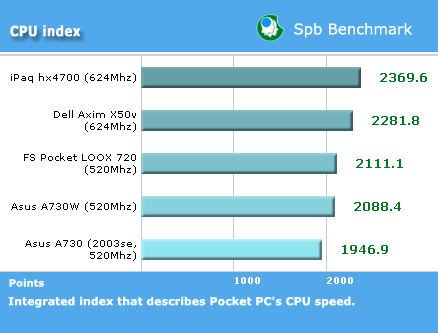 The CPU index reveals similar results. This time and farther on we see that Asus A730W performs slightly better than the A730, we think, this happens because the RAM chip is replaced, we have no other explanations (the ROM version is the same). 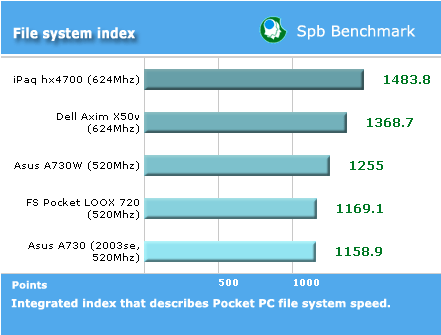 The file system index describes Pocket PC file system speed (read/write/transfer). The handheld by HP is leading. 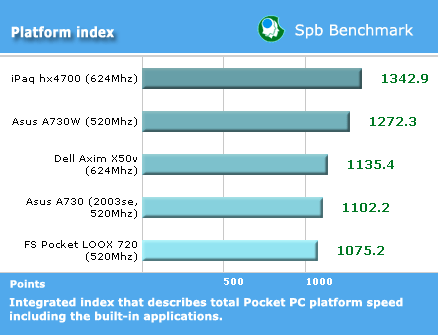 This index describes total Pocket PC speed including the built-in applications. The models occupy the same positions as in the previous test. The fact is the speed with applications depends greatly on the file system speed. Despite of the fact HP iPaq hx4700 features USB 2.0, it has little advantage in the data transfer speed against the models with USB 1.1. The maker of the graphical chip Intel had to provide some explanations to the public (follow the link to read the full version). It says, currently programs (including graphic test packages) and games do not involve high level API (Application programming interface), such as GDI, OpenGL ES and Direct3D Mobile, each application should be optimized to certain hardware (ATI Imageon, Intel 2700G). That means, in near future before the switch to high level API, programs and games are divided into two camps: the one supports graphical accelerators and the other - don't. This process is familiar to the computer industry, remember first graphical accelerators for PC, when games were specially adapted to 3Dfx. The same way will follow handheld computers, probably the process will take less time, but not an instant. And now we have to put up with the fact, the majority of applications do not use opportunities of application programming interface. We used Beta Player to access the real PDA productivity. At the moment this is virtually the only tool to have an objective productivity comparison of VGA Pocket PC. The good performance is with 120-130%, the clip is played smoothly, with no slowdowns. At 100-110% the playback will be slower in active scenes. 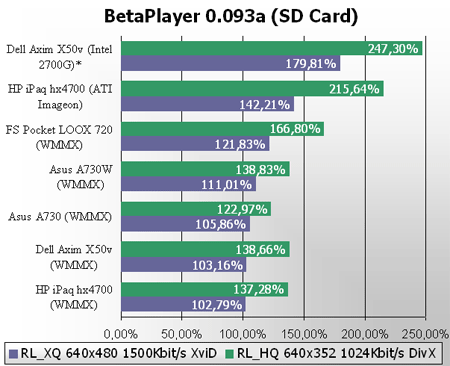 The first diagram stands for BetaPlayer 0.04 (RAM), there is no optimization to graphical accelerators (acceleration for the ATI chip is off). We ran this test to show video playback without the programming acceleration. 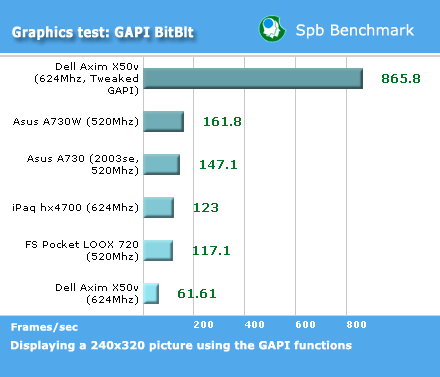 As we see, the presence of the accelerator didn't improve the productivity performance, even on the contrary (Dell X50v). The heaviest clip (RL_XQ) ran with difficulties, at the level of 100%, Asus A730 failed to run it because of low RAM. The movies of this quality will be played with frequent jerks. Let's see the situation with the playback from the storage card under the same conditions. The speed has become slower, but not due to limited slot speeds (we talked about it above), the fact is that the reading takes some processor time, as the PDA lacks direct memory access function (DMA). In result – it's difficult to watch movies in good quality without conversion, without optimization the graphical accelerator does not increase the speeds, it even slows it down. The models by Dell and HP are ahead with a considerable gap, we see clear advantages of the programming acceleration. The playback from the memory card, which is of great practical importance, doesn't change the overall picture. 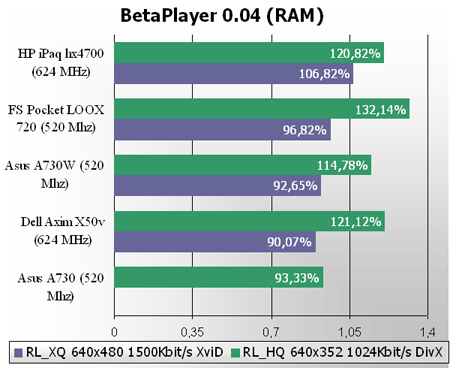 The widely used RL_XQ sample was made one year ago in order to have an extra high quality sample which could be the target of further player optimizations. A full movie with these settings would not fit on a 1GB memory card. 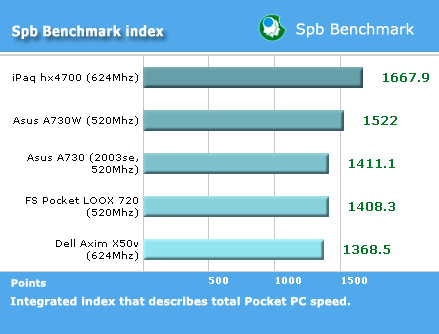 The benchmark summary shows that all VGA Pocket PCs can play this sample above 100% average speed (with latest player). So even with four times as many pixels these devices are well capable of high quality media playback thanks to the wireless MMX instructions supported by the new Intel XScale CPU and the special additional graphics chips found in some of them. The winner is the new Dell X50v with the Intel 2700G Marathon chip which takes off almost all video calculations from the CPU. You can even set the device to power saving mode (208 Mhz) and still have a decent video playback. All given handhelds are powered by Windows Mobile 2003 for Pocket PC SE, you can learn more about its standard opportunities in the respective review published on our site. Let's compare the set of additional applications, whether preloaded or stored on the CD. Only trail versions, non-adapted to VGA. Calculator, some simple games and the software to work with the Chinese language. Almost all models have the voucher for certain number of points (see the table above), which can be exchanged for applications at special sites. So you have a chance to get very good application by this way. HP iPaq has the richest package, Pocket Informant is of great value. Dell model has a poor set of preinstalled applications, an extra CD with 2 games compensate for it in part. Asus A730 features the poorest set of preinstalled programs, and the extra CD has an unclear set of trial applications. Besides they are adapter to VGA-resolution, among them you can come across the map of Hong Kong or the program to work with the Chinese language. It is very topical for the European or the US markets, isn't it? To complete this chapter, we'll note, all basic applications for Pocket PC are already adapted to VGA-resolution by developers, the situation was improved since the release of Toshiba e800. The only weak point here, there is a shortage in really good games, fully adapted to VGA-resolution, you can count them by fingers of your hand. As we said in the very beginning, the presence of the built-in camera greatly restricts the corporate use of PDA, the devices equipped with built-in cameras are often the subject to ban. For example, influenced by corporate customers Fujitsu Siemens had to release the modification Pocket LOOX 718, which wasn't initially planned. Only Asus has no version without the camera. We won't go into details with cameras of Asus A730 and FS Pocket LOOX 720, just in brief. The picture quality is comparable in both models, the flash is useless, the model by Asus has richer camera settings, however the camera itself is slower. The price for these models varies about $600 (prices for Europe), only Asus A730 stands out with $500. Dell resorts to dumping methods on the US market only and offers different prices for Europe. Let's give marks from 1 to 10 to all PDAs in the assessment by main features to complete our test. We tried to make the most objective comparison we could, in different views, considering different features. Only you, our readers can judge whether we succeeded or not. Eventually each of you should decided, which criterion is the most decisive one (high quality screen, battery life, dimensions, ergonomics, camera). This is the very reason, why you shouldn't sum up all separate points. All the PDAs we tested today do differ from each other, you can't say for sure one of them is worse than others: every model has its peculiarity.